Whether you’re looking for your company to achieve its first 100 Facebook followers or approaching your first million on Instagram, you need an organic social media strategy to bring your business to its full potential. Unfortunately, organic social media is often times discussed as an opposing force to paid social media. However, organic and paid social media shouldn’t be framed as the choice between the ‘red pill or the green pill’. The company that neglects an organic social media strategy is missing out on critical milestones in growing their business. While paid social advertising may seem like the total package, it is only one part of a bigger outreach picture. Here are five ways that using an organic social media strategy is still relevant to your digital marketing success. The first step to properly using either digital strategy is understanding how they work. Organic social media is the practice of using one of the many social media platforms’ free services (i.e. posting media, status updates) to build a community of people who love your brand. Paid social media will display your ads to a specific group of users the software anticipates will be interested in your product or services based on demographic information, focusing mainly on ‘clicks’ accrued. Both tactics aim to attract a strong community of followers to your business, hopefully leading to potential buyers and lovers of your products or services. Is your business run by a collection of laptops sitting in an abandoned office space or is it run by hard-working people? We’re thinking (and hoping) that the latter is true. Guess what? Your customers are, too! An organic social media marketing strategy keeps your social outlets updated with relevant content that can benefit a newcomer who wants to know more about your business. When potential customers see a social media page that is actively launching content they begin to build trust in your brand. Users who venture to a company’s social media page are already looking for a reason to trust your offer- an organic social media strategy shows users they can put their faith in your brand. If you find that hard to believe, just look at the numbers: “Social media marketing has a 100x% higher lead-to-close rate than paid marketing" (source). The key here is the social aspect- customers want to feel connected to your brand. What do you want it to look like when your potential buyers visit your social media pages? Will your posts be filled with witty captions? Interesting content showing your knowledge on a relevant subject? Or will users go to your page only to find that there haven’t been any updates since April of 2009? Because consistent and timely content is key with your success with organic social, we recommend taking an automated marketing approach to social media management. What do we mean by marketing automation? We simply mean engaging with a software designed to effectively manage your marketing efforts and tasks in one, all-inclusive platform. For us, that platform is HubSpot. In fact, we just became a HubSpot Certified Agency Partner (yay!) Get in touch if you'd like to discuss more on how HubSpot has helped us streamline and improve our social media marketing efforts. 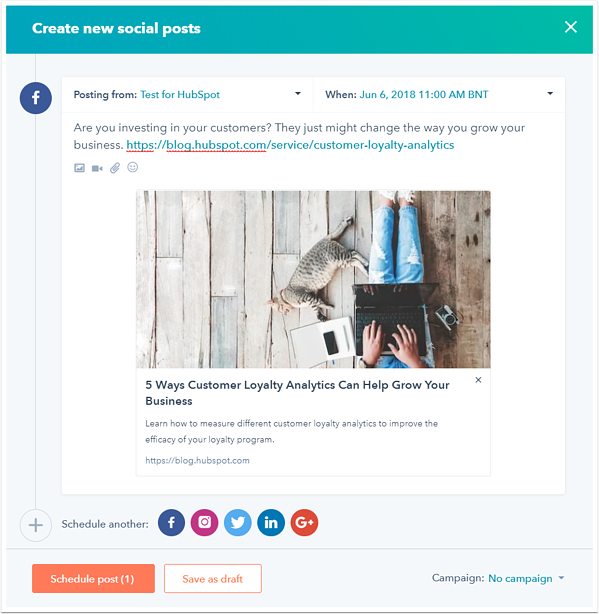 Example of social media publishing in HubSpot. Schedule posts in advance. Stay ahead of the game. Attracting the right people with your social media pages is a huge part of why organic social media marketing is still relevant. With organic social media marketing strategies, you can fill in the blanks for the potential buyer who wants to know more about you and your brand. When you started your business, you had a very specific buyer in mind; the right product or service for just the right person. That idea shouldn’t change with your organic social media strategy. When you are consistently producing content that fits your ‘Perfect Customer’ with topics that are relevant to them, you are building trust by tackling problems or questions affecting them specifically. An organic social media strategy that captures the nuances of your particular company and customers will bring in genuine connection with people who understand that your company was made just for them. Organic social media is the best way to do this; organic social allows you to share your values and culture while still learning about/building relationships with your buyers. This tactic has twice the benefit if you’re monitoring your content correctly. If you pay close attention to your organic social media, you’ll find customers telling you exactly what they want and how they want it. Are users sharing your videos? Do users prefer 1000-word blogs? In this way, your buyers can demystify the organic social media marketing strategy for you. You can triple your exposure by using SEO best practices with your fresh content, providing even more exposure to potential new clients. In case you aren’t in the know, SEO, or 'search engine optimization', is, in short, the process of using specific keywords in your content so that your work appears in a web search engine’s unpaid results, increasing the visibility of your business. For example, buyers who Google “local vegan joint in Philly” can find your article on the “5 Best Vegan Spots in Philly” because your content carries strategic and helpful messaging around the phrases “vegan” and “Philly”. So when you’re creating content that is relevant to your buyer, you are actually increasing the chances that the people who need your services will find you online. This is especially useful when your organic media strategy is updated and consistent. Users will be hard-pressed to find content posted eight months ago on your site. Your customer finds your relevant information useful, and you’ve found a new potential lead! Who could say no to that? Interested in hearing more about SEO and optimizing your website for search? Check out this blog - we think you’ll like it. The power of word of mouth should never be ignored when using an organic social media strategy. When social media users love your content, they’re telling others about it! They’re sharing your blogs, photography, videos, and content you’ve worked hard to populate your social pages with. In the same vein, customers are looking to each other to find the right information about your brand. It turns out that 88% of people trust online reviews written by other consumers as much as they trust recommendations from personal contacts, and 81% of people are saying they're influenced by what their friends share on social media (source). The word of mouth surrounding your brand is just as important as the content you’re creating if you want a fully rounded marketing strategy with the best possible results. If your budget is relatively small, you can engage with your brand’s buyers and allow them to bring the Word of Mouth back to your business with no cost to you. Engaged communities give businesses life. If your followers love your content, they’re doing the legwork around traffic for your content and bringing in new customers. When you build a strong organic social media marketing strategy, it will be there for your brand even when there’s no room for paid promotion in your budget. Let’s say something in your budgeting has shifted and from this point for the rest of the year, you can no longer use your paid social programming. If your organic methods are strong, you can continue to reach out to your current customers and gain new ones. Organic social media marketing strategies can seem intimidating, but consider that uncertainty a necessary part of the trial and error period. With every new post, tweet or status update, you are learning more about your buyers and what they want while they learn what you value as a brand and how you can help them. Once you’ve tackled organic social media strategy, go a step further and combine that with a paid social strategy for even more impressive results. Get in touch with the Digital Services Team at Mole Street today to discuss Marketing Automation and Social Media Management today.